The latest Environment and History has an article by Susan Lawrence and Peter Davies, "The Sludge Question: The Regulation of Mine Tailings in Nineteenth-Century Victoria". Mining waste was a significant environmental problem in nineteenth-century Victoria, an Australian colony dependent on gold mining for its economic prosperity. Sludge from alluvial (placer) workings and hard-rock mining flowed into rivers across the colony causing significant damage and disruption to downstream communities. The sludge problem was eventually resolved by the passage of legislation early in the twentieth century. The struggle to control sludge reveals changes in public perception over a fifty-year period, from acceptance of sludge as an inevitable consequence of industry to the identification of sludge as pollution that should be eliminated. Significantly, at a time when the cost of dealing with noxious waste from other industries was still being borne by the public purse, the anti-sludge legislation held the mining industry responsible for its own pollution and required gold miners to return clean water to river systems. The article is one in a series by the authors on environmental aspects of the Australian gold fields. The goldrush in Victoria during the 1850s and 1860s created new awareness of the many meanings and values of water. Most mining technologies required substantial quantities of water to power machinery and separate gold from the earth, but available supplies were often inadequate. Miners responded by constructing dams and lengthy races to capture, store and distribute water to mining claims. In the process they created extensive landscapes of water management, where the natural flow of water was layered with industrial, legal, commercial and social flows as well. 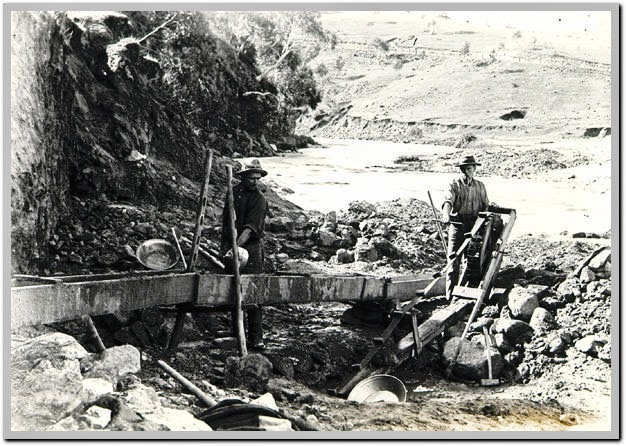 Experience in water manipulation on the Victorian goldfields played an important role in the later development of water laws and state water management.